Many different symptoms say YOU NEED TO SET HEALTHIER BOUNDARIES. Such as being tired, feeling resentment, attracting negative people. Emptiness, feeling numb inside. How is that all connected with boundaries?! You might ask. Let me explain. When we talk about boundaries, we mean emotional, mental, energetical and any self-care. Self-care is impossible if you don't know how to keep your space safe and clear. Our personal space is very important. And you're the only one responsible for it. You can't blame other people for spreading negativity on you. You allowed it. When you agreed to have coffee with that negative friend, didn't you know what was going to happen?! Well, let's say, you hoped that time it would have been different and yes, I know, you couldn't say no because she sounded really upset! Here is the thing I don't need to tell you that you have to set better boundaries, you probably already know that. The question, what makes us allow others to violate our boundaries over and over again? 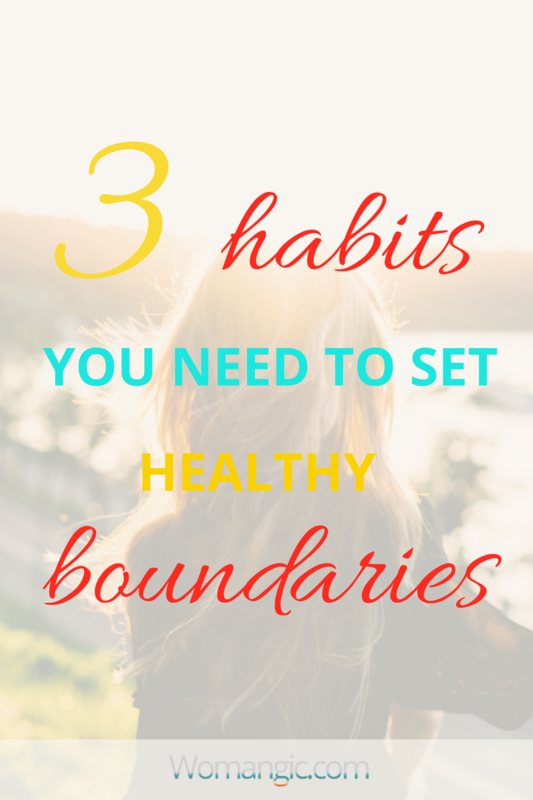 Let's go through 3 reason why we do it and three habits you need to have to set radically powerful boundaries. 1. Track Unwillingness to let go of the old beliefs. One of my clients Elen came to me because she was desperate to understand why her partner didn't appreciate her and behaved like their relationships were the least important thing for him. She told me with tears in her eyes: "I do everything for him! He doesn't see it...!" 'What exactly do you do?" - I asked. She started to count, mentioning everything from early daily breakfasts, ironing, shopping to booking spaces for his hobby games. She gasped. "What do you mean?" - her eyes widened in awe. "I mean, - I said calmly, - what does he do for you?" "He...he..., - she tried to come up with something, - he loves me..?" Elen had a very clear impression how relationships should look like. A woman does everything. She was struggling for a while but didn't want to let go of that idea. She believed man loved a woman because of what she did for him. She didn't want to see that what she thought he wanted from her was not what he needed. Elen felt resentment mostly because of her beliefs, not the situation itself (although the situation required radical improvement). When she let go of this belief, was willing to understand his needs, she was able to set healthy boundaries and feel much more respected and appreciated in her relationships. If your boundaries are violated, ask yourself: What does make me say no to myself and yes to others? Why do I have to do this? Write down your ideas and ask someone you trust if s(he) can help you to see another perspective on it. How can you change these assumptions? How can they serve your good? 2. Let Go Of Victim mindset. Victim mindset is a big topic... My relationship with it is like a detective story, where a thief runs away from a spy with a craft and smartness of a genius. Every time I try to catch it, it slips away from me. But I found one thing that it can't resist. It's like a magic spell, that hypnotizes a robber for a moment, so he lets out some of his secrets. Victim mindset swallows our energy when we feel separated, full of resentment, indignation about someone's behavior, alone. But it can't stand radical self-acceptance and love. Most of the time when we feel strong resentment about someone, we're angry at ourselves, we are furious because deep inside we had felt it was wrong, but still had done it, still had stayed with the same person. Here where radical self-acceptance comes along. When you stop for a moment to say to yourself: "I fully love and accept myself no matter what," victim mindset steps out. Yout boundaries restore immediately. Because who is guilty doesn't matter anymore. It never did. What matters is your experience, your lessons, your joy. And what you take out of any situation, what you learn from it. 3. Change a belief that you need to help everyone. Then this friend who takes away your energy (and nothing else) calls crying, and off you go. Jump in the car and drive to that coffee shop to spend another few days sick afterward. It clearly violates your boundaries and pollutes your personal space. Why do we keep doing this? Many of us grew up in religious cultures. Even new age philosophy talk a lot about serving. But here is the trick, when it combines with our belief "I have to help people" it becomes a very negative thing, that poisons our lives. You're here for a reason. Your life matters more than you can imagine. Everything starts with you. If your energy isn't clear and aligned with your high truth, you're not able to help anyone. I know it can be a hard truth for many of us who devote our lives to other people. It knocked me down when I finally got it. It took me lots of suffering, betrayal, pain to figure that. People never meant wrong to me. They just DIDN'T need my help in the first place! I violated their boundaries, unique experiences with my crazy drive to solve their problems. So they broke my personal space in return. Think about it... do you feel deep inside you're obligatory to serve people...? Do you sometimes think: "If not me... who else...?" It's time to break this pattern. You're obligatory to help, love, nourish only one person. YOU. I know you'll never use it against others, never become egoistic, because caring is your nature. And this is beautiful. But you have to use some of this drive for yourself. Start today, start small and you'll see how your boundaries will restore and how resentment will leave your mind and heart forever.